I must be honest. I’m not a true once-a-month cook. I tried. I strived (or strove). But it wasn’t easy. So instead of once-a-month cooking, I break cooking down into easy pieces and parts. We’ve talked about fixing simple suppers and doubling recipes. The other sock-it-away strategy I use is when-you-do-the-big-shop-cooking. Big-shop cooking came about because I avoid the grocery store. I try my best not to go there unless absolutely necessary. We do our grocery shopping around pay days, so twice a month. Sure we need to run to get milk every now and then. However, since I’ve been following Kerri’s two-week menu planning example and posting my meal plans, those trips are fewer. It’s intentional. Money-saving too. Hey! I can talk myself into two steps. When the score comes in from the grocery store, this mama cooks. Right then. Just like Kim, I put the slow cooker to work browning ground beef, ground turkey and/or chicken. The big-shop cooking amounts to two steps: (1) stirring then (2) bagging. The whole point is you have the main ingredient ready for simple suppers. I really don’t like to stand and cook meat for meals throughout the week. I’d rather do it just once or twice a month. I can pull a pound of cooked, ground turkey from the freezer and easily put together a favorite tater tot casserole. If I get those enormous bags of cheese and put in a bit of effort bagging it up in smaller bags, I have cheese for over a month – without going back to the store. So before I even go grocery shopping, there’s the list. Kerri does a beautiful job of covering this step in parts 1 and 2 of her series, What’s for Dinner? For big-shop cooking I need to add a few things to my list. Set the stage. Ready for action. Fridge: rearrange remaining items to accommodate the new ones. Wipe down shelves using a disinfecting wipe or warm, wet paper towel. Pantry: a quick straighten. Throw out the boxes with only cereal dust. Sweep pantry floor. Slow cooker: put it out on the counter, ready for action. Don’t put the meat in the fridge. Cook it. Whew! You survived the shopping. You are back from the store, the groceries are unloaded and mostly put away. All you want to do is put your feet up. You can handle big shop cooking! It’s easy. You’ve already done the prep. 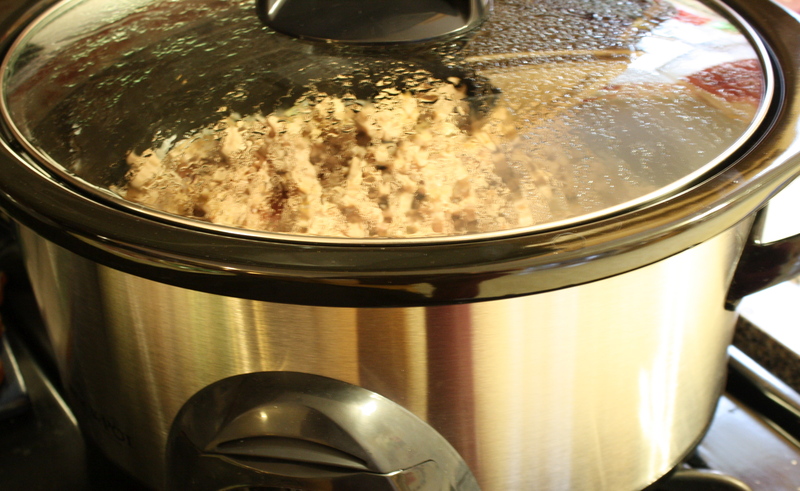 Easy route: Open the package and slide the entire 4-5 pounds of uncooked meat into the crock pot. 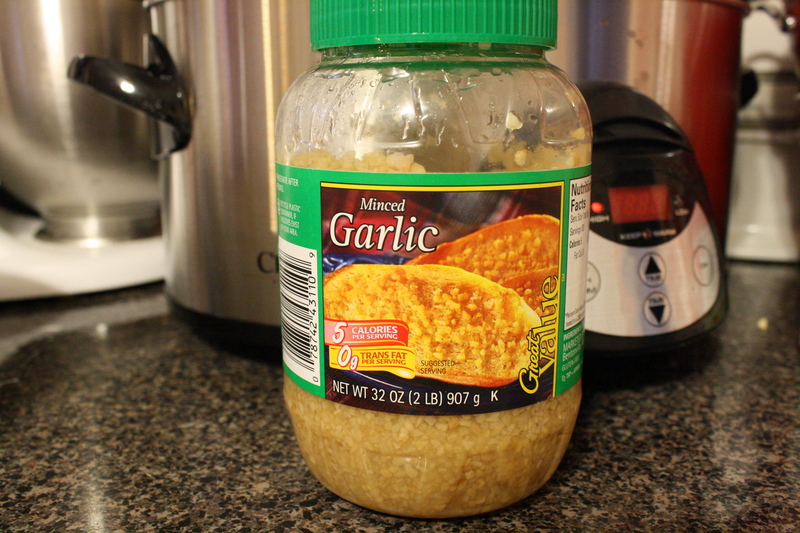 Stir in about ½ cup, frozen, chopped onion and 1 tablespoon minced garlic. As you walk by later, stir again and break up the meat. Cook on low until brown. About 3-4 hours. Bit more labor intensive: brown portion of ground beef. With the other half, fashion meatloaves, meatballs and or hamburger patties. I alternate each month for variety. 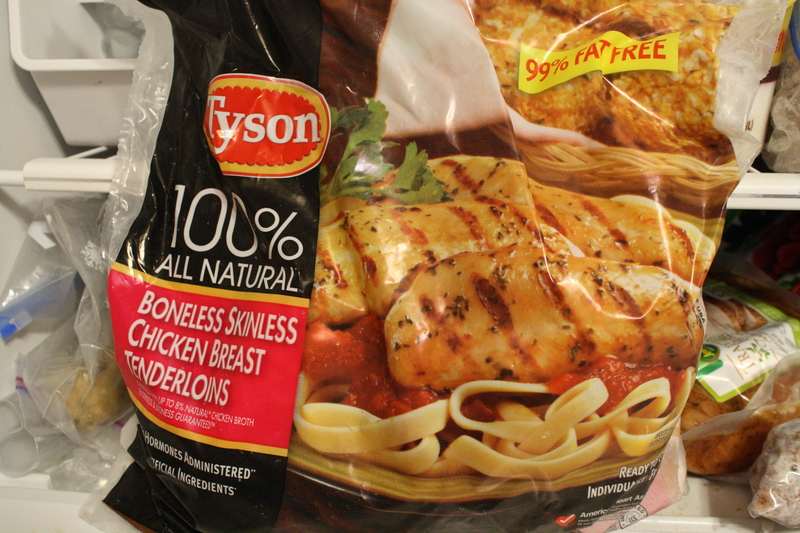 I buy the big bags of frozen chicken tenderloins. Season with garlic and lemon. Cook on low 4-5 hours. (You can save money by purchasing a whole chicken. The Happy Housewife gives instructions on how to cook a whole chicken in the crock pot). Drain your meat and let it cool. (If you cooked a bunch of chicken you can save the broth and freeze it). 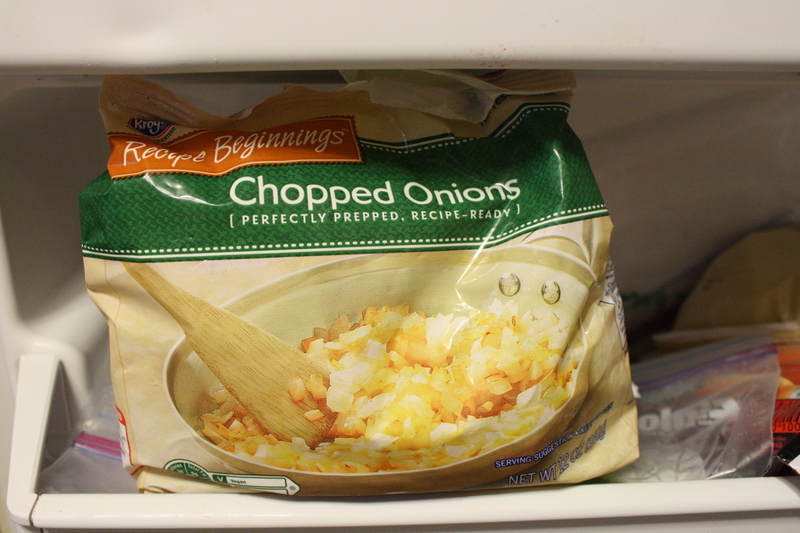 Bag up into quart-sized bags, ready for weeknight action. -Don’t forget cheese. About every six weeks we get these huge bags of shredded cheese. We like cheese. 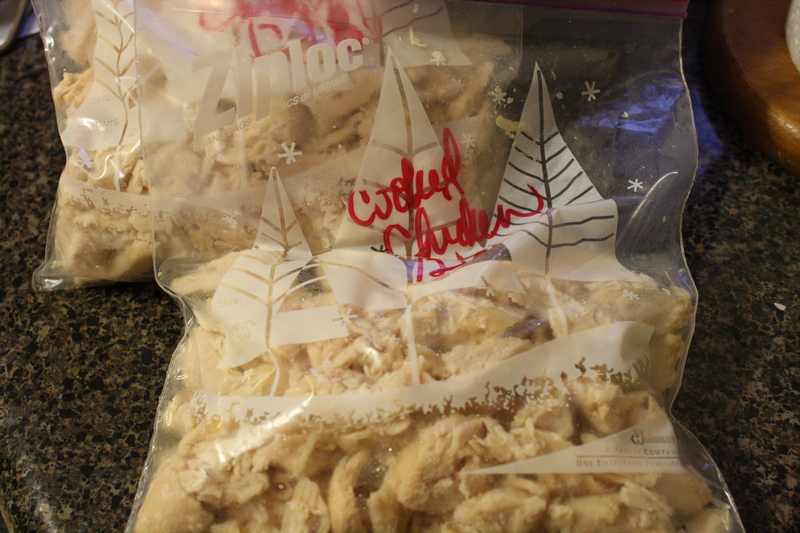 I can divide the bags into about eight (8) quart-sized freezer bags and stick them in the freezer. Pull one out when it’s casserole or taco time. Pick one you’re the most likely to do. Take the easy route and just brown a bunch of ground beef. Stick with that for a few months. Add in others as you get into the habit. You asked in email for details on doubling recipes? Each of the examples in last week’s post, Back to basics: Vacation planning, is a link to Hodgepodge. -Tricia homeschools five children from preschool to middle school. She’s forsaken life in the drive thru lane for the road home. She’s saving bucks and her sanity with the frugal recipes and sock it away strategies of her Southern roots. You can find her facing that daily dose of chaos at Hodgepodge. Tricia is a.k.a. Hodgepodgemom. Updated from the March 2009 archives. I love the idea of getting the pantry and refrigerator ready for the new groceries BEFORE the shopping trip! Great ideas. Thanks! great site! thanks for sharing. I love simple and I love slow cooking! thanks for the reminder picts to label the freezer bags. Great post! Thanks Laura! An important step I didn’t write about. It’s sometimes hard to tell what the meat is after it’s frozen solid 🙂 Especially the difference between g. turkey and g. beef. WOW!!!!!!!!!!! I see the advantages but it seems a little overwhelming =) Thank you so much, I am learning so much!! For me, it has to be easy!